According to prosecutors on Monday afternoon, a man from California will not face charges after making threats against elementary schools on the internet just days after the Newtown, Connecticut elementary school shooting. The man was identified as Kyle Bangayan, 24, and the district attorney’s office said that he did not make any specific threats to a victim or to a school before he was booked at the downtown jail on Sunday. He was being investigated for issuing criminal threats, according to ABC News. Bangayan is from Pomona and told officers that he was joking when he wrote that if people do not stop posting on Facebook about the shooting at Sandy Hook Elementary, he would do the exact same thing. He claims that his joke received a couple of laughs. He also wrote online that thousands of children die in other countries and that Americans needed to get past the shooting on Friday. The east Hollywood home of Bangayan’s father was visited by FBI agents and police officers after a resident told investigators about the postings on the internet. The investigation was closed by the FBI after talking to the suspect’s parents, searched his car, searched his apartment and ultimately found nothing threatening. 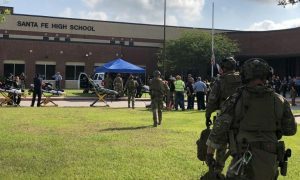 “When we get information like this, we take it very seriously, even more so now in light of the Connecticut school shootings,” Cmdr. Andrew Smith said. The Los Angeles Police Department has been handed the joint investigation and FBI spokeswoman Laura Eimiller said that there will not be any federal charges filed against the suspect. Authorities said that Bangayan’s father authorized a search of the home when officers knocked on his door. Police did say that nine weapons, along with ammunition were taken from the property. Among the weapons, rifles, a shotgun and handguns were removed from the property. Authorities have not said if the weapons belonged to Bangayan or the father. 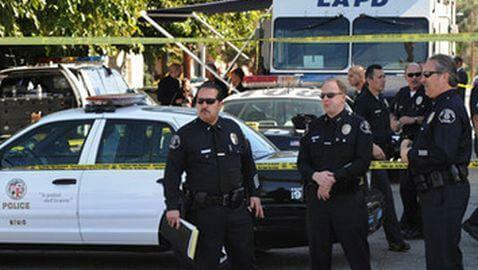 At Bangayan’s residence in Pomona, no weapons were found.